Pfc. Joseph Love, 22, was killed by a roadside bomb near Balad on Sunday while on duty with a truck convoy to repair a pipeline. Love was posthumously awarded the Bronze Star, Combat Action Badge and Purple Heart. Schofield Barracks Pfc. Joseph Love was more interested in talking about the Iraqi children and people he met since arriving there in December than his job of soldiering. "He liked to see the kids' faces," his stepmother, Nisha Harris-Fowler, told the Anchorage Daily News this week. "He liked to see them smile." Dan Fowler told the Alaska newspaper that his stepson also believed his work in Iraq was trying to undo injustice. Part of the reason he joined the Army was so he could eventually attend college and study architecture. But he also had a strong sense of justice. "He joined because he really believed in the end, he wanted to bring freedom to these people," Fowler told the Daily News. "He believed in the ultimate good in things." Love, 22, was killed by a roadside bomb near Balad Sunday while part of a truck convoy to repair a pipeline. A memorial service for Love will be held at 11 a.m. on April 19 at Schofield Barracks main chapel. His family told the Alaska newspaper that Love loved music, from the alternative rock group Cake to classical cello music by Yo Yo Ma. He also liked playing guitar with his dad and shooting pool with his mom. Love was assigned to Company B, 84th Engineer Combat Battalion (Heavy), as a carpentry and masonry specialist. He was the third member of the 84th Engineer Battalion, stationed at Schofield Barracks, to die in Iraq. Love was posthumously awarded the Bronze Star, Combat Action Badge and Purple Heart. He is survived by his mother, Patricia Smith, step-father Daniel Fowler and sisters, Brittney and Elizabeth Fowler. Love was born in Puyallup, Wash., but also lived in Sacramento, Calif., and Fairbanks. 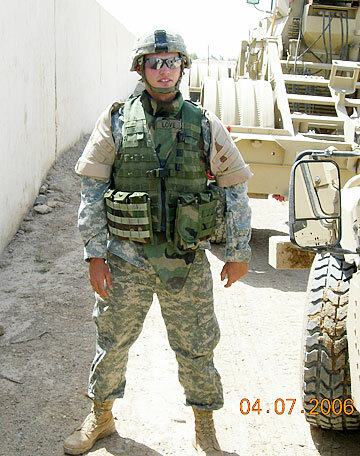 He graduated from a Fairbanks high school in 2002 and enlisted in the Army in March 2005 and was assigned to Schofield Barracks in July. A total of 28 soldiers, 47 Marines and one civilian with Hawaii ties have been killed in Iraq since the war started in March 2003. In Afghanistan Hawaii's loses have amounted to 15 soldiers, 10 Marines and six sailors.